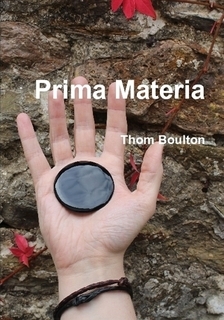 The cover artwork on this first collection from Thom Boulton resonates in a way which may be peculiarly relevant to the poetry. I’m reminded, perhaps because of his recent demise, of the films of Nicolas Roeg, particularly Don’t Look Now (the red petals) and the outstretched palm which strangely parallels the prospector’s moment of discovery in Eureka, a seminal sequence which prefigures a downward spiral. The journey in Boulton’s poetry is rather from dark to light, with plenty of intervening complexity to add a touch of reality to ‘the magic,’ but a concern with questioning received protocols is true in both cases. Surface appearances are seductive but nothing is what it seems. There are seven ‘chapter headings’ in this collection, moving from an early psychological breakdown to a more enlightened view of the world, taking in a range of experience and subject matter along the way. Although this work is filtered through a central notion of alchemy – in its strict sense of transformation – and has a pretty much pantheistic sense of things, it’s also concerned with the modern world, with technology, with politics and with our increasingly problematic relationship to ‘nature’. There is a short and useful preface which encapsulates the author’s view of things but which in no way obstructs or prevents the reader’s interpretation of the poetry. The poetry itself is modern, tightly constructed and also looks good on the page. The punning here is both witty and confrontational, the author assertive and seeking an audience yet emotionally engaged and aware of fragility. Poetry with a confessional element may be coming back into the mainstream of British poetry though with the exception of Barry MacSweeney (hardly mainstream and he’s been dead for some years now) it’s been the Americans such as Plath, Sexton and Lowell who have followed this groove most successfully. Thom Boulton’s work lies partly within this tradition, sometimes direct and up-front, at others more tangential but there’s certainly a psychological thrust here which deals with the self and with the possibilities of transformation through disturbance and breakdown. If ‘Leaky Taps’ deals with ‘the destruction of the ego’, as stated in the chapter preface, then ‘Unsound Reality’, as also prefaced, deals with dreams and conflicting feelings: ‘Cotton ball stuffed into the lung / like a grandmother’s hand violating a turkey, / and you there – eating it all up, /….’, from ‘At home with Judas’. they became possessed – not air. eyed me and passed judgement. From ‘A Side of Sublimation’ we get the wonderfully titled ‘Looking for Jeremy Corbyn (…)’, where on what I take to be a fantasy train journey from Penzance to London we have a surreal encounter between Tony Blair, the author as ‘Just a lowly pagan in a black tie’, Jeremy Corbyn and an ‘off piste’ reference to Phil Jupitus which has an hilarious Alice-in-Wonderland dream logic: ‘I’d probably stare, / a fish in a frying pan, / and somehow tumble out, / ‘Tony Blair’s face is over there and / he wants a word with you.’ In the final section ‘Coagulated Oil’ where ‘all aspects of the self unite / and become whole.’, we have references to David Bowie, The Dead Sea Scrolls, and a strange coda in the form of ‘a Short While Later’ which appears to document a transformation of the self while combining a personalised mythology with pagan imagery and a hint towards socialist politics. I’m unsure in the end whether the organising principle of the seven interrelated sections entirely works but there is a strong overall sense of direction in this collection which combines a variety of formal devices, from the tercet (‘That Date’, an intriguing exploration) and the list (‘Gigantomachy’) to the riddling folk stanzas of ‘The Book of Days’ and covers a lot of ground in terms of its personal odyssey. This is an unusual debut in its mix of the arcane and the modern, of the ‘spiritual’ and the ‘secular’, the practical and the esoteric, the light and the dark, tempered with a good dose of humour and popular culture. I’m intrigued as to where Thom Boulton is going to go next after such an idiosyncratic and unexpected first collection.